Let's make it a day of great remembrance (and educational opportunity) of our Reformed heritage. We encourage all scholars to dress up this Friday, October 30th! Read below for facts about Reformation Day and costume suggestions. On Oct 31, 1517, Martin Luther posted his 95 Theses (or statements) on the door of Castle Church in Wittenberg, Germany. This act triggered the movement in world history known as the Reformation. The Reformation was the great rediscovery of the good news of salvation by grace through faith in Jesus Christ. At that time, the Roman Catholic Church had become corrupt and was teaching false doctrines like salvation through good works. The Protestant church that we worship in today is the result of Luther's brave acts to restore the gospel to its rightful place as the cornerstone doctrine of Christianity . Luther translated the Bible from Latin to German so the common man could read the Bible himself. Red is the liturgical color for this day, which represents the holy spirit and Martyrs of the Christian Church. On Oct 31, 1517, Martin Luther (then a Catholic monk) posted his 95 Theses (or statements) on the door of Castle Church in Wittenberg, Germany. This act triggered the movement in world history known as the Reformation. The Reformation was the great rediscovery of the good news of salvation by grace through faith in Jesus Christ. At that time, the Roman Catholic Church had become corrupt and was teaching false doctrines like salvation through good works. Some were selling “indulgences.” They said if you purchased these indulgences, you would gain forgiveness for sins. Although, Reformation Day is more commonly celebrated in the Lutheran Church, Martin Luther is a hero of faith for us, too. Protestant churches that we worship in today are the result of Luther's brave acts to restore the gospel—salvation through Jesus Christ—to its rightful place as the cornerstone doctrine of Christianity. ● Costumes! 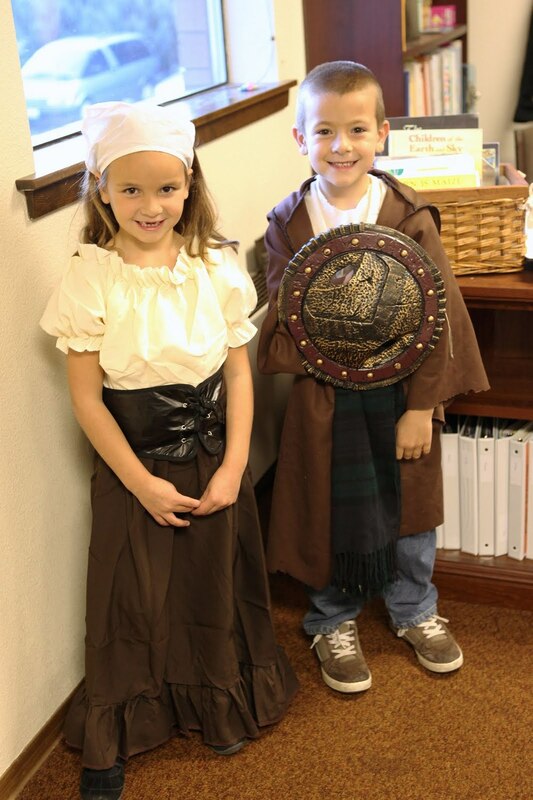 You can dress up for Reformation Day. Simple costumes can be made or purchased. Consider any type of Renaissance attire: princes, knights, Robin Hoods, princesses, fair maidens, even nuns or monks. For a youngster’s monk costume, simply take a adult-size brown turtleneck and used a cord to tie the waist. Check thrift stores and Halloween sales at Target and Wal-Mart. ● Sign a Mighty Fortress. This hymn was written by Martin Luther. Click here to watch a video of this song with lyrics. ● Create a stain-glass window, using black construction paper, wax paper and colored tissue paper. When Luther returned from hiding to Wittenburg, he discovered that there had been riots and many of the church buildings and windows had been damaged. Luther helped restore those churches and helped bring order to the congregations who were now confused about how to worship God. ● In your own handwriting, copy one page of the Bible. In Luther's time the Bible was only in Latin—a language that most people could not read. To make God's Word accessible to everyone, Luther translated the Bible from Latin to German. ● Practice writing with a “quill,” using a feather and watered-down poster paint. ● Read a book about Martin Luther. I suggest the illustrated book, Martin Luther-A Man Who Changed the World, by Paul L. Maier. ● Make Reformation Day cards to give to friends and family to teach them about this day . ● Eat Renaissance or German food—turkey legs (or chicken legs for little fingers), German stroganoff, strudel, etc. ● Reenact Luther's acts and story. Give children small wooden hammers, with which they can pretend “hammering” the 95 Theses to the front door.